Having a gutter system on your house or building is an excellent first step in managing rain water as it comes off the roof. This protects your property against potential water damage. 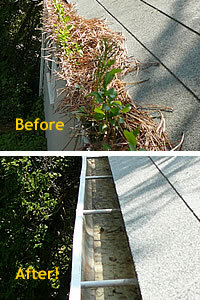 However, your gutter system will only remain effective if it is well maintained. Above All Roofing believes that every gutter system should be cleaned at least once a year to make sure there is no clogging or damage to your gutter system, which can greatly reduce its effectiveness. 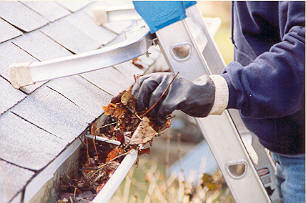 You can have leaking miters, end caps or downspouts which slowly drip water up against the fascia, trim or on walkways…potentially leading to wood rot or erosion or ice build up in the winter. If you don’t properly maintain your gutter and downspout system by keeping them free of debris, they can be more susceptible to clogging and building up with snow and ice during the winter. Worse yet, in some instances, they can fail, potentially causing costly property damage. Finally, non-functioning gutters can also mean that water is standing in your gutters, creating a perfect breeding ground for mosquitoes, carpenter ants and other insects. 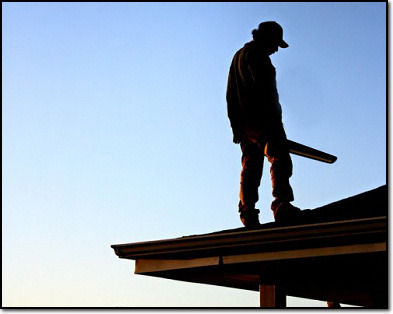 At Above All Roofing, we know how gutters are installed, how they function and how they are to be serviced and maintained. Our cleanings include a close inspection of the leaders and downspouts to make sure they are free of debris so water flows freely, minor adjustments and reconnections if needed.